Do you miss eating noodles as much as I do? Nearly zero carb shirataki noodles may very well change your life. Have you seen shirataki noodles in the grocery store? You may find them on a shelf either with the organic or Asian foods or in the refrigerated section. I’ve tried Miracle Noodles and House Foods’ Tofu Shirataki, but there are other brands such as Skinny Noodles and Zero Noodles too (affiliate links). If you want to know more, check out How to Cook & Like Shirataki Noodles at KetoDiet Blog. The noodles are stored in liquid, so first drain and rinse them. Boil the noodles for about 2 minutes. Drain and rinse again. Place the noodles in a dry nonstick skillet over medium heat until no moisture remains. Drier noodles means better texture. Important note: I once skipped the three-step prep and regretted it. The noodles were so bad that I would never have bought them again if it had been my first time. These noodles work better in Asian dishes than in Italian dishes, probably because their texture reminds me more of rice noodles than pasta. 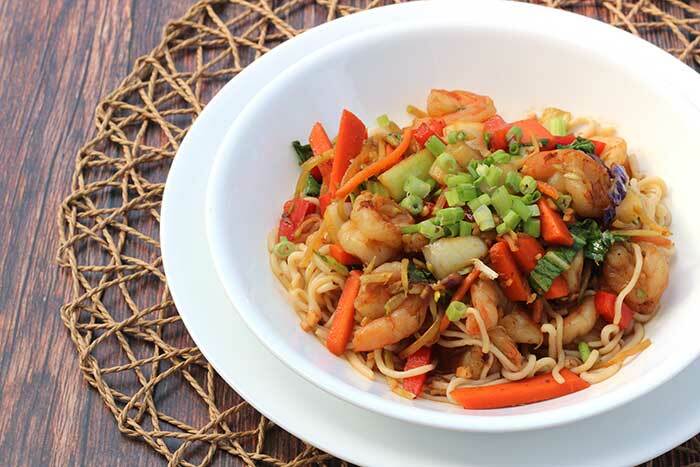 I especially like them in seafood stir-fries like the one below and recipes like Thai Shrimp and Noodles. Are shirataki noodles as good as “real” noodles? No. Am I happy I can enjoy a normal-sized serving of noodles without the subsequent blood glucose spike? You bet. Rinse and drain noodles in a small mesh strainer. Bring a large saucepan of water to a boil over high heat. Add noodles and cook for 3 minutes. Drain. Using the same saucepan or a medium nonstick skillet, heat the noodles in the dry pan, stirring frequently, until the noodles are no longer moist. In a wok or very large skillet, heat 1 tablespoon of oil over medium-high heat. Add half of shrimp and cook until they just turn opaque, about 2 minutes. Remove to a paper towel-lined plate. Repeat with remaining shrimp. Add remaining 1 tablespoon oil to wok. Add carrots and stir-fry for about a minute. Add red bell peppers and stir-fry for about a minute. Add white parts of bok choy and scallions and stir-fry about a minute. Add broccoli slaw and green parts of bok choy and stir-fry about a minute. Return shrimp to the pan and add sauce. Cook for a minute or two until sauce thickens and shrimp is hot again. Mix in noodles and garnish with green parts of scallions. Time-saving tips: Use minced ginger and garlic from a jar. You can also purchase pre-chopped veggies (fresh or frozen).